Colors: Purple, Turquoise and Aqua Tulle with Mint colored Lace. Foam flowers in Purple, Turquoise and Aqua. High Chair Banner "one" available in Silver or Gold. 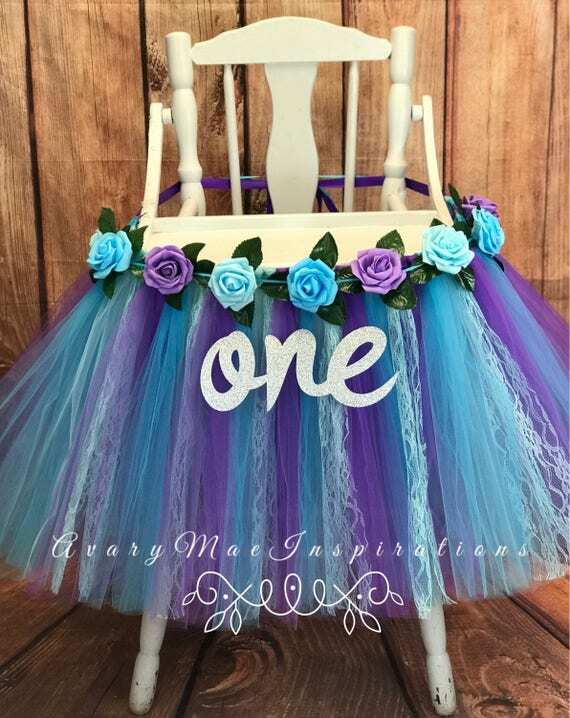 High Chair Tutu in this listing pictured is 18" Long. I LOVE custom orders message me with any detail changes! Listing price is for a 36" Tray (which should cover standard high chair trays). Tulle, Artificial Flowers, and ribbon. Roses are made of latex foam,looks like real roses, very soft. The banner will come with Velcro that attaches directly to the tulle. Artificial Roses are hot glued to coordinating ribbon that can be attached to the high chair tutu. Roses may vary slightly in color due to availability. This skirt is full and beautiful. I use 4 layers of tulle. I attach to tulle to color coordinating ribbon which makes it easy to tie around the back of the highchair. I have this skirt on a high chair but you could also use as a Photo prop, Table Skirt, Tulle skirt up to 36” waist and more. If you need a different length just message me. I’ll be happy to custom make another size. 2. Apply the 'Hook' Velcro dot (the rougher feeling one) to the outside of the high chair tray approx every 4 inches. 4. Carefully tie the tutu around the back of the tray into a pretty bow. 5. You can leave the skirt "as is" or you can attach a birthday banner to the front. AvaryMaeInspirations is NOT responsible for any damage caused by your attaching method. If you a request for another color theme message me and I will happily make one for you! Follow Us On Social Media! You'll see examples, customer photos, shop updates and sneak peeks of new designs! Make sure and tag us in your party photos! Ladies Fuchsia Tutu- Adult Pink Tutu Skirt- Woman's Tutu- Pink Tutu Skirt-All Sizes- Custom colors- Will Custom Make All Requests!